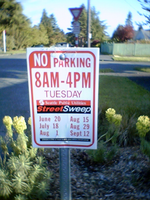 5 Blocks around our house have been selected for a pilot project from Seattle Public Utilities: Street Sweep. For one year they will sweep the streets, each side every other week. And to make people move their cars temporary parking signs have been installed. All of that is fine by me, but what I really hate is that they installed one of these many parking signs right in front of our bedroom window at 8am. Actually that's not the worst: The worst was that they first installed those roughly 100 no-parking signs at regular height, like the give way sign in the background of the picture and then 3 weeks later they revisited every single pole to cut it short to the lower height of other no parking signs. WTF? Nobody cares if the signs are at standing height or at sitting in a car height. People will just leaver their cars out anyway, since the FAQ states that no tickets will be issued. Way to burn some taxes, Seattle! Just like the Monorail for which you collect taxes, but I'll never see it built! And by the way, your website looks ugly in my Firefox on Mac. Ei, wennse denn dann einen Transrapid bauen, dann wird's kritisch. Und bei uns kommt ja auch noch der SOLIZUSCHLAG dazu. Den der Osten sinnlos verplempert, wie es im Spiegel steht, jawohl. Man hat vorsichtshalber schon mal angefangen Geld einzusammeln. Je nach Wert des eigenen Automobils muss man ordentlich Zuschlag zahlen (fuer unseren 12 Jahre alten Ford, sind es noch 250$/Jahr). Und das machen die schon seit Jahren.